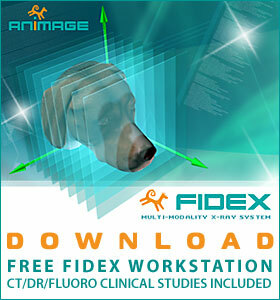 FIDEX Multi-Modality Veterinary CR/CT/Fluoroscopy Scanner from Animage.News. Sound™ and Animage, LLC have now partnered to bring FIDEX to the U.S. veterinary community. Animage is the maker of FIDEX, the only fully three-modality diagnostic imaging system to meet all of your advanced imaging needs. For further information, please contact Stephen Della Ratta at 408.605.7628 or email at sratta@animage.com and visit www.animage.com. First two Fidex scanners went on-line in Australia. The Section 179 limit has been increased from $25,000 to $500,000 for 2015. You have until 12/31/15 to take this advantage. Learn more and calculate your savings here. It is official: the BFF Lab has a CT scanner. Animage is very happy to be part of this exciting research done at XROMM lab in Stockton College. It was an exciting day for the BFF Lab — we installed and operated our Animage CT scanner for the first time! We selected a preserved specimen of a mudpuppy salamander (Necturus) to anoint our system. You can see the animation below of the anterior half of the salamander’s skeleton. The XROMM lab at Richard Stockton University is coming together piece by piece. We are forever grateful to lab director Justine Ciraolo and our NAMS shop director William Harron for so much help in obtaining and coordinating our receipt of this equipment. We also want to give a big shout out to Stephen Della Ratta of Animage for his help, enthusiasm, and expertise in setting up our CT scanner. First two FIDEX scanners installed in New Zealand, one in Hamilton, North Island for Dr Keith Houston, and one in Christchurch, South Island for Dr Mehrtens. The machines attract much attention with National TV present. A large number of veterinarians were present to see the first 3D images of cats and dogs, a first for New Zealand. Animage, LLC has received the Frost and Sullivan 2014 Customer Service Leadership Award for the veterinary imaging industry of North America. 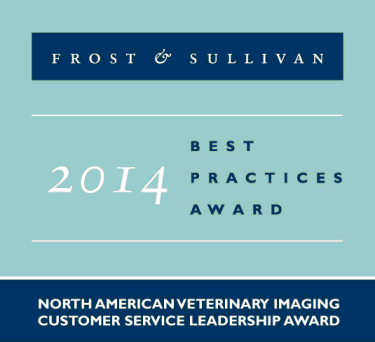 Animage, LLC has been rewarded with Frost and Sullivan’s 2014 Customer Service Leadership Award for the veterinary imaging industry of North America. FIDEX, our unique 3-modality x-ray scanner for the veterinary clinic, makes Animage a leader in the global market for advanced x-ray imaging devices. It provides CT, digital radiography and fluoroscopy in a single unit. We are immensely proud to announce winning this prestigious award for excellence in service. We always put the customer first, making sure FIDEX runs optimally and reliably. The company has set up a remote service and maintenance tool, monitoring all FIDEX scanners around the clock and around the globe. We are always there to keep you safe and productive. Un nouvel outil d’imagerie radiographique et scanner. Depuis quelques annees, les scanners a usage veterinaire se multiplient en France. Depuis 2012 une nouvelle machine concue et developpee pour les veterinaires est commercialisee en Europe a partir des USA. Cette machine utilise pour sa partie scanner une nouvelle technique : le Cone Beam ou faisceau conique. La machine FIDEX utilisee dans cette etude est la premiere concue pour les veterinaires. Elle est pour l’instant la seule a utiliser des algorithmes de reconstruction optimises pour les animaux (tissus mou et osseux). Elle presente l’avantage d’un cout d’exploitation faible. Il est possible de l’amortir beaucoup plus facilement qu’un scanner fan-beam. Si l’utilisation de cette machine est extremement simple, la lecture des scanners reste une affaire de specialiste. Hnizdo J., Valasek P., Tikal L., Trapek M. Cone-Beam computed tomography in the diagnosis of atypical medial coronoid process lesions. Veterinarstvi 2013;63:813-820. The paper presents the use of a new imaging technology, cone beam computed tomography CBCT, for the diagnosis of atypical lesions in the medial coronoid process (MCP) in dogs. CT is a highly sensitive imaging modality for detection of subchondral fissures and MCP fragmentation, as well as for evaluation of joint incongruency. In this presented paper three cases are discussed. 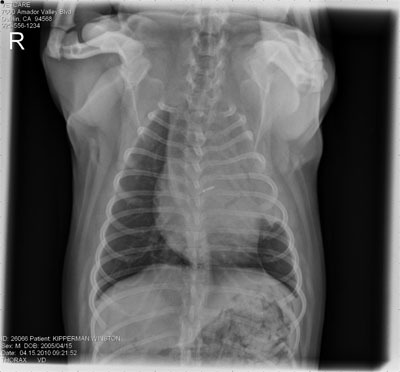 The first case report describes a six month old stafordshire terrier with elbow pain and negative radiologic findings. A subchondral fissure of the MCP and incongruency was detected with CBCT. Even during the arthroscopic exam this lesion was not immediately visible. The second case report deals with a six year old Appenzeller Sennendog with acute onset of lameness and pain in the elbow joint, also with negative radiographic findings. First arthroscopic exam was not diagnostic and only decent cartilage changes were detected. Late fragmetation of MCP was diagnosed with CBCT few months later. As of March 27, we now have three FIDEX machines taking care of advanced imaging in the Czech Republic. The first machine came to Dr. Jan Hnizdo’s Bila Hora Clinic in Prague in January, and two more were delivered and installed at private practices in Zdar (Dr. Johanides) and Slany (Drs. Fiedler) outside the capital. Installations and training was organized by Atomvet, our distributor in the Czech Republic. After translation of the User Manual into Czech, FIDEX is being operated safely by non-English speakers without problems thanks to its intuitive graphical user interface. Of particular importance was the small footprint of FIDEX, its low electrical power requirements, and ease of installation. All machines delivered diagnostic results within hours of set-up. A small delegation from California headquarters was present to support them, fighting late season snow and ice – and happy to congratulate the new users for choosing FIDEX as their central radiology tool. PALO ALTO, CA and PLEASANTON, CA--(Marketwire - Jan 31, 2013) - Fovia Inc., a global leader in advanced visualization, and Animage, LLC, an innovative developer and manufacturer of veterinary imaging equipment, today announced that Animage will enhance its product offering by integrating Fovia's High Definition Volume Rendering® into Fidex, its unique, three-modality diagnostic imaging system. FIDEX demo now available for download. Provides an opportunity to load, observe, and research X-Ray images collected during real clinical work. All most important imaging functions are available. See what FIDEX can do for your practice. 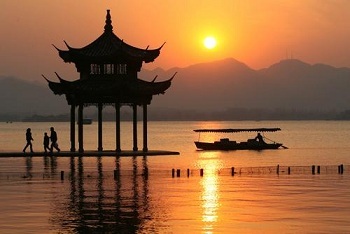 FIDEX was recently introduced at the West and East China Veterinary Conference in Hangzhou, China, close to Shanghai. Animage president Dr. Horst Bruning gave the introductory talk and answered questions of interested Chinese veterinarians and business people. FIDEX is ideally suited for the Chinese veterinary market due to its compact footprint and multiple applications. 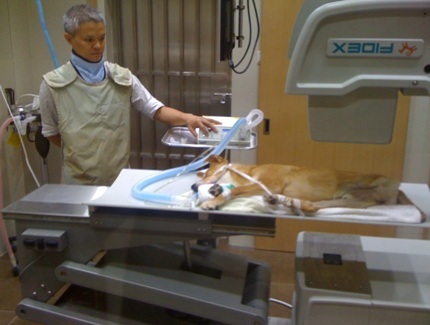 Western-style veterinary practices are rapidly growing in China, and advanced imaging as provided by FIDEX are an important part of this development. Animage is proud to announce installation of a first FIDEX system in Canada, at McGill University in Montreal, Quebec. The team at the Research Division of Montreal’s General Hospital has received the full system (all 3 modalities) on April 26, 2012. It was installed next doors to the surgery room, making future use very convenient. We are excited about new applications, in particular using FIDEX as volumetric image input to a surgical navigation system. Be prepared to see cutting edge technology from this site. Dr. Roland Rigori and his team of five veterinarians placed a FIDEX system into their clinic d’Oiselet in Bourgoin Jallieu near Lyon. This is the first installation in Europe, and FIDEX needed the appropriate CE mark to get there. The intuitive graphical user interface allowed the veterinarians to take control from day one, and obtain good images from the start. We wish good success to the clinic with this new instrument! Last week, Animage founders Dr Horst and Irene Bruning and technician Phil Collins went halfway around the world to install the first Fidex system in Asia, thus marking Animage’s and Fidex’s entrance into the global marketplace. Dr Tiong selected the CT and fluoroscopy configuration of Fidex for his clinic, not needing Fidex’s DR option since his clinic already had that capability. Fidex’s CT and fluoroscopy modalities will add to the advanced imaging services of Dr Tiong’s clinic, and in turn contribute to the well-being of Hong Kong’s companion animals. Dr Tiong’s Fidex now shares space with an MRI scanner and an ultrasound system. Space is indeed precious in Hong Kong, and Fidex’s small footprint makes adding Fidex’s multi-modality capabilities much more practical just on those terms. Animage is in discussion with further potential users of Fidex in Asia, including Japan and others in China. Europe should also soon be the next continent to get its first Fidex. Dr Tiong says, “Installation of my Fidex was much quicker than I anticipated. It was great that we were already making CT scans the very next morning.” He continued, “Although we received a thorough training course from Horst and Irene, I found that I could intuitively figure out how to make good scans of a turtle, a dog, and a bird right away. In the coming months, Animage will be at Dr Tiong’s disposal to help him with any questions or needs as he uses his Fidex. We wish Dr Tiong much and long-lasting success with the exciting capabilities of his new Fidex. Animage, LLC brought a three-modality Fidex system to the 83rd Western Veterinary Conference where it made quite an impression. More than once, upon hearing how little Fidex costs to install, operate, and maintain while making images as good or better than what they’re used to, veterinarians familiar with the expense of installing, operating, and maintaining a refurbished human CT scanner were heard to exclaim, “This looks too good to be true!” Of course, we then demonstrated how Fidex is indeed as good as it seems. We met a lot of great people from all around the USA and the world and started many conversations that would appear to be heading in the direction of further installations of Fidex systems. 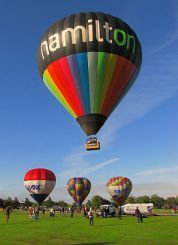 Many states of the USA were represented, as well as people from Brazil, Canada, Ireland, Japan, Mexico, New Zealand, Spain, and Sweden. We look forward to further discussion with everyone! 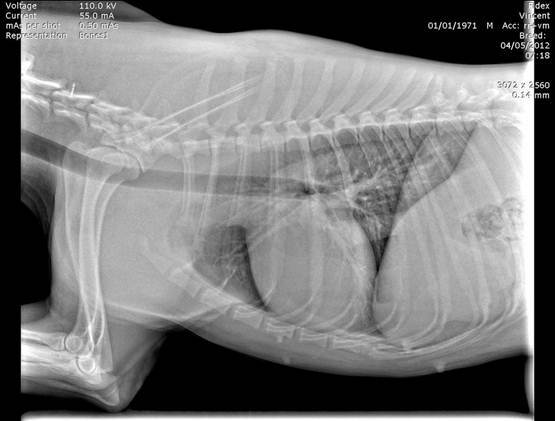 A pug dog presenting with acute onset lethargy was tentatively diagnosed with aspiration pneumonia, based on lab work and radiographs. After standard treatment seemed not to have effect, further examination was performed by CT scan via Fidex from Animage, LLC. The CT scan revealed a lung lobe torsion. The patient was treated surgically. The patient then began improving and recovered completely after five days. Winston, a 5 year-old, male neutered Pug presented to the Veterinary Emergency and Specialist Center with acute onset lethargy. Physical examination confirmed lethargy and mild fever. Dyspnea was not evident. Lab work revealed an elevated white blood cell count, and radiographs revealed complete consolidation of the left cranial lung lobe with air bronchograms (Figure 1). A tentative diagnosis of aspiration pneumonia was made, and therapy was initiated with IV fluids and broad-spectrum antibiotics. No improvement was noted over the day. Winston was anesthetized with Propofol, and a thoracic CT scan (via Fidex, from Animage, LLC) was performed using a standard breath-hold technique. Pre- and post-contrast images revealed complete consolidation of the left cranial lung lobe with alveolar infiltrates. Air pockets were noted in the central regions of the lobe (Figure 2). The main-stem bronchus to this lobe was constricted at the base and opacified. All other lung lobes appeared normal. CT diagnosis was left cranial lung lobe torsion. The next day a left lateral thoracotomy was performed, with resection of the diseased and infarcted lung lobe. Recovery was uneventful after analgesic support including meloxicam, fentanyl, and local intercostal nerve blocks. Histopathology of the excised lung lobe revealed acute fibrinohemorrhagic necrosis. Winston made a complete recovery by day 5 after surgery. Winston’s clinical and radiographic findings were suggestive of pneumonia. The decision to pursue CT was based on the absence of any known predisposing factors (vomiting, anesthesia, immuno-suppression) and the known predisposition of young Pugs to develop this disease. In this case, the availability of, and decision to pursue CT imaging early was pivotal in achieving a positive outcome. ii Moon, M, Fossum, TW. Lung lobe torsion. In; Bonagura, JD, ed. Kirk’s Current Veterinary Therapy XII; Small Animal Practice. Philadelphia; WB Saunders Co, 1995; 919-921.
iii Murphy, KA, Brisson, BA; Evaluation of lung lobe torsion in Pugs; 7 cases. Journal American Veterinary Medical Association 2006; No 1; 86-90.
iv Seiler, G, Schwarz, T, Vignoli, M, Rodriguez, D. Computed tomographic features of lung lobe torsion. Journal of Veterinary Radiology and Ultrasound, Vol 49, No 6, 2008; 504-508. Animage, LLC exhibited their multi-modality veterinary diagnostic imaging system at the ACVIM Forum in Anaheim, CA on June 10, 11, 12, 2010. ACVIM attendees from all over the USA and eleven nations visited the Animage booth. Visitors to the Animage booth were uniformly impressed by the economies of space, power, and financial resources Fidex offers, as well as by Fidex’s image quality and ease of use. 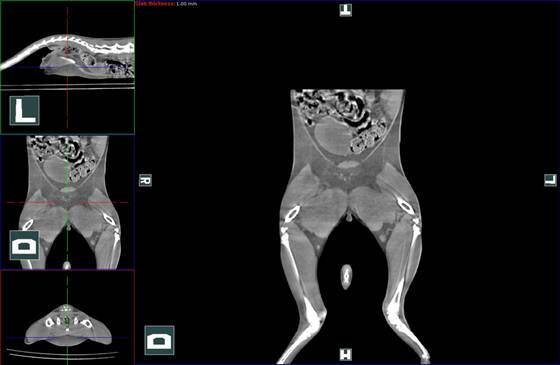 Many took the opportunity to take mouse in hand and perform no-X-ray CT ‘scans’, search the Fidex database, and manipulate stored Fidex CT images – learning first-hand how easy indeed Fidex is to operate. 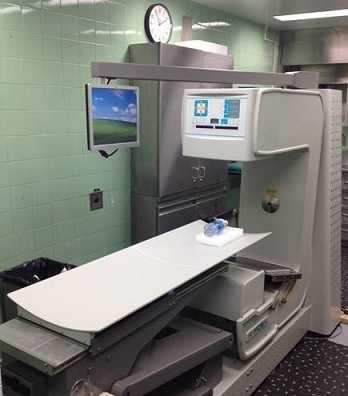 Animage, LLC has finished and integrated new software upgrades for Fidex, Animage’s multi-modality veterinary diagnostic imaging system that has CT, DR, and fluoroscopy in one machine. The new upgrades make Fidex’s image quality even better. These and any other software upgrades can easily be added to Fidex systems in the field. During the two-year warranty period of Fidex software, upgrades are available free of charge. The upgrades mainly concern CT image reconstruction. This includes new image reconstruction algorithms that improve upon Fidex’s already excellent image quality. There are now new reconstruction algorithms and respective mode selections for imaging bone, chest, soft tissue, and brain tissue. Generally, the upgrades address artifacts that are typical of CT imaging. Such software is the specialty of Animage’s parent company, Exxim Computing Corporation, which is used by CT hardware manufacturers worldwide. The upgrades reduce or eliminate ‘noise’ and ‘artifacts’ generated within images, thus making images more clear and better rendered for accurate analysis and diagnosis. A specific way the upgrade will improve image quality is in the ability to discern very subtle variations within various tissues. This will probably be most noticeable in the soft tissue mode and the new brain tissue mode. The upgrade also makes table control more accurate and gives a larger field of view in Preview mode. Animage, LLC has been very busy with a succession of veterinary conference exhibitions and stirring up quite a bit of interest among their attendees. Animage was at the Western Veterinary Conference (WVC) in Las Vegas February 15 – 17 and at the American Animal Hospital Association (AAHA) Conference March 19 – 20. Veterinarians from all over North America, Europe, Asia, and Australia came by Animage’s booth and were treated to seeing something that is truly new and unique to veterinary medicine - something that could make CT imaging practical for many more veterinary clinics and their clients, thus sparing many more pets painful procedures and delayed diagnoses. Animage had the privilege of meeting many wonderful and talented people. Among them were a good number of very interested veterinarians, practice managers, and technicians in the USA and abroad who are now seriously considering installing Fidex systems in their practices. In turn, these people are passing the word on to their friends and associates in the profession. In the coming months Animage will exhibit and demonstrate Fidex at further veterinary conferences. June 10 – 12 will see Animage at the American College of Veterinary Internal Medicine (ACVIM) Forum in Anaheim, California. On July 15 – 18, Animage will be at the Pacific Veterinary Conference in San Francisco, California - just a forty-five minute drive from Animage’s headquarters in Pleasanton, California. Animage, LLC, a veterinary diagnostic imaging technology company, has begun clinical trial of its premier product, Fidex, a multiple-modality diagnostic imaging system designed specifically for use in small animal veterinary practice and clinical research laboratories. A Fidex system has been installed in Dr Barry Kipperman’s VetCare Emergency and Specialty Care Center in Dublin, California. Site delivery and installation took only about three hours. Dr Kipperman and his staff are undergoing familiarization and training on Fidex, as well as learning how to use manipulate and use the images Fidex creates. At the same time, Dr Kipperman and his staff are providing Animage with valuable information on how to optimize Fidex for veterinary practice. Fidex is the first system of its kind in veterinary diagnostic imaging. Fidex has in one machine radiography (CR or DR), computed tomography (CT), and fluoroscopy. This creates unprecedented economies of both space and financial resources for veterinarians who want to add to their clinics’ diagnostic imaging capabilities, but might have been inhibited from doing so by the availability of space or financial resources that adding one or two additional machines would require. Even as just a CT scanner, Fidex offers a brand new system that is smaller, requires much less power and room modification, is less complex, is easier to operate and maintain, and costs less to operate and maintain than a refurbished, used human CT scanner. Fidex is comparable in price to refurbished, used human CT scanners. Animage is now preparing a Fidex system for installation at the UC Davis School of Veterinary Medicine sometime i n September, where it will undergo further clinical trial. Animage plans to make Fidex available to the marketplace around the end of October, 2009. Animage, LLC of Pleasanton, California was founded in 2008 by parent company Exxim Computing Corporation in order to create unique diagnostic imaging products dedicated to the veterinary practice industry. Exxim is a diagnostic imaging technology company that creates CT imaging software products for customers worldwide, including Siemens, Imaging Sciences, and many others. VetCare Emergency and Specialty Care Center, of Dublin, California, was founded in 1997 by Dr Barry Kipperman, DVM. VetCare is a 24-hour-a-day veterinary hospital providing internal medicine, surgery, and emergency services. Dr Kipperman earned his Doctor of Veterinary Medicine degree in 1987 from the University of Missouri. He was board certified in internal medicine in 1994. Dr. Kipperman is an expert in veterinary ethics and animal advocacy, and is an author of numerous articles on these topics. Dr Kipperman is also a guest lecturer on veterinary medical ethics at the UC Davis School of Veterinary Medicine. National Instruments, creators and manufacturers of open graphical programming software and modular hardware invited Animage to their annual NIWeek show on August 6, 2009, as a featured company that has used their products in exceptional and innovative ways. 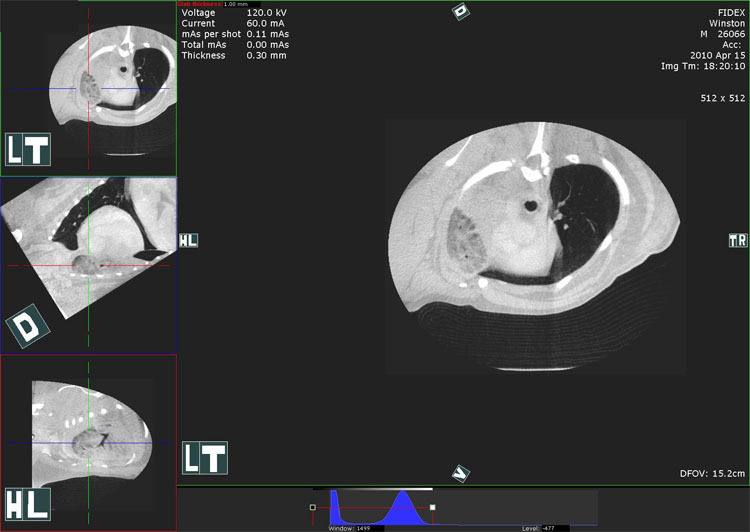 Animage uses NI’s LabView and Single-Board RIO to facilitate design, development, and programming of Fidex, Animage’s new multi-modality veterinary diagnostic imaging system. Animage was represented in the presentation by James Carver, principal of Jamco Engineering and mechanical engineering contractor to Animage; and Dr Ivan Charamisinau, System Engineer for Animage. Mr Carver addressed over 3,000 engineers to give them an overview of the capabilities of Fidex as well as the technical and economic advantages made possible in the development of Fidex by LabView and Single-Board RIO. After the presentation, Mr Carver and Dr Charamisinau were joined by Mark Hazarabedian, Director of Marketing for Animage, to take questions from members of the worldwide engineering and technology press. National Instruments creates and manufactures open graphical programming software and modular hardware used by engineers and scientists in more than 30,000 companies around the world to design, prototype, and deploy systems for test, control, and embedded design applications. Using NI, customers simplify development, increase productivity, and dramatically reduce time to market. From testing next-generation gaming systems to creating breakthrough medical devices, NI customers continuously develop innovative technologies that impact millions of people.